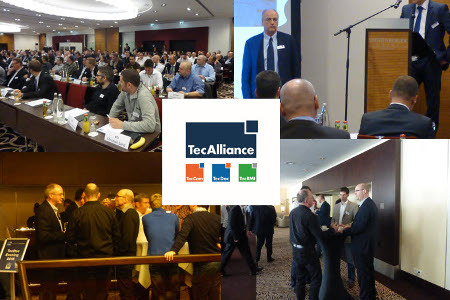 190 participants met at the Steigenberger Hotel in the Charlottenburg district of Berlin on 19 November 2015 for the International Data Supplier Meeting. Once again it was clear how important it is to the parts manufacturers’ data specialists to share information with colleagues in the industry. The participants felt at ease in this well-known location and used both the TecDoc Evening that preceded the meeting and the workshops and presentations for intensive and lively discussions. Following an introduction from TecAlliance managing director Jürgen Buchert, David Winter, Executive Vice President Customer Management, gave a presentation on the business development and sales activities of TecDoc. OptiCat COO Bryan Thueson described catalogue development in the USA and emphasised the importance of consistent data standards in catalogue systems in his presentation. The speakers began the workshops by providing the most important information about their topics. The participants then had the opportunity to share their views about the issues and discuss them with the speakers and their industry colleagues. At the end of the workshops, the questions raised by the participants were collected together and presented in a concluding session. Many of the participants were disappointed that there was not more time. Next year’s International Data Supplier Meeting will therefore begin with a lunch at 12 noon on 8 November 2016. The TecDoc Evening will begin at 7 p.m. as usual. The second day of the Data Supplier Meeting will start at 9.30 a.m. on 9 November 2016. Further details will be provided in the personal invitations in the run-up to the event. Impressions of the International Data Supplier Meeting 2015 in Berlin.